Guest Post From Daddy Knows Less | Daddy's in Charge? Today we are having our first ever guest post here at Daddy's in Charge? I am honored to introduce you to Justin from Daddy Knows Less. I was fortunate to work with him many years ago at my old job in television. That was back before I had kids and my sanity was still intact. For those that don't know Justin, I feel he has a tremendous ability to tell a story and his blog is one that I truly enjoy. Without further ado, I bring you Daddy Knows Less. I don't know why stay-at-home dads like John complain so much. Complain about their kids not eating. Complain about the not listening. Complain about all of the housework. If you ask me, stay-at-home dads have it pretty darn good. Or so I thought after I took two days off just for myself in mid-July. My wife was at work. The Peanut (my 4 year-old daughter) was at daycare. I had the house to myself. I went for a run, I got errands done, I completed some projects around the house. And those were just the mornings. In the afternoon, I made Starbucks my hangout and I got a lot of writing done. "This is the life," I thought to myself. My wife thought the same thing, even though she was working. As I dropped her off at the train station for a second straight morning, she said, "I can get used to this." I bet she can. Me too. But in reality, we both need to work. We both want to work. And even if I were a stay-at-home dad, the Peanut wouldn't be in full-time daycare. Half day? Sure. I look back on those two days fondly. I was busy. I got a lot done. And I still cooked fresh meals both days. And it was relaxing. That was not the case two other days later in the month. When it was just me and the Peanut. We try to keep her out of daycare enough to save a month's worth of costs during summer. And if we're not on vacation, I take off from work to be with her. On the first day, we were leaving for a quick family vacation when my wife got home from work. I remember looking at the clock at one point in the morning. It read just 8:30am. I was knee deep in laundry (needed for the trip). The Peanut hadn't eaten anything (she "wasn't hungry"). Hell the dog hadn't even peed. I quickly tweeted my angst and almost immediately, John answered. Stay-at-home dad extraordinaire. "Run errands," he suggested. Oh, I've got errands. We're going to IKEA. Big mistake. The whole IKEA experience with the Peanut deserved its own blog post. Two things I'm learning about being a stay-at-home dad: First, there's a lot of watching the clock. They're like football coaches running a two-minute offense at the end of the half. Budgeting their time and their time outs. Second, you need a plan. You need activities for pretty much every minute of the day. We did this when she was a baby. How come we don't do this anymore? When did we lose control? On my second stay-at-home day, I did have a plan. 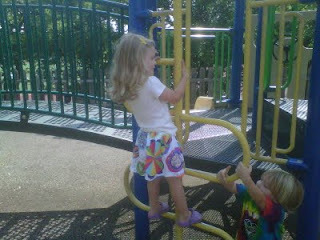 We ate breakfast and went to the playground. I followed the Peanut on each piece of equipment, and noticed a little boy who couldn't have been more than eighteen months old was all by himself on one of the slides. I said out loud, "I bet your parents are paying someone a lot of money not to watch you on the playground." Then I noticed another little boy knock over a girl whose mother was busy talking on her cell phone. The boy's mother was mortified. I said, "That may not have happened if she wasn't talking on the phone." I realized then I would make very few friends at the playground if I were a stay-at-home dad. We came back for lunch, and I was going to take the Peanut to see the Jets at training camp. (She is a Giants fan because her favorite color is blue. I'm doing what I can to subtly influence her opinion.) But they moved practice inside because of thunderstorms. Crap. I had no backup plan. So we played princesses. We watched Cinderella. We watched the same freakin' episode of Strawberry Shortcake on Netflix three times. I was going a little insane. At 4pm I called my wife at work. "Any chance you're coming home early?" Nope. She then told me if I didn't let her off the phone she wouldn't get her work done in time to leave. "No, she's not at her desk," my wife told me. "You're really struggling for some adult conversation, aren't you?" "You'd never make it as a stay-at-home dad." No... I wouldn't. This is why I think John is himself slowly going insane. And why I enjoy reading his blog. This is why I can't wait to go back to my high-pressure, deadline-filled, demanding job in television news. So I can relax. Thanks so much Justin! It's nice to know that you finally understands what it's like to be me. At least my job anyway. If you would like more of DKL you can follow him on Twitter or Facebook, or just go to his blog for all the good stuff, Daddyknowsless.blogspot.com. Tomorrow I will be appearing on his site, at least my lego guy will be. Stay tuned for that! Talk about a kick in the nuts! Thanks you so much for guest posting, and realizing I have the hardest job in the world, oh gotta go Ellens on! Justin, you're quitting day care and going back to your TV job??!! Say it ain't so! High praise from the sister in law! She never comments on my blog posts... LOL. Another great post by Justin, but heh what can do you expect! the man is a writing genius! Don't tell that to my kids... they are still on the lookout for him. Great post Justin. I'm jealous that you had 2 days by yourself! I think the last time I had that was right before I gave birth to Tyler. And let's not forget the greatest luxury about going off to work... Using the bathroom in peace! with Napoli is too high. with a move to Real Madrid. unrealistic and is twice as high as the striker’s actual market value..
told as reported by Indo Eleven. they suffered a 2-0 defeat in Bavaria last week. Bayern, although I hope that I am wrong,” he said.